Home Latest News World News Aerostar contracts with Fastjet for a319 maintenance to cement its growing African market presence. 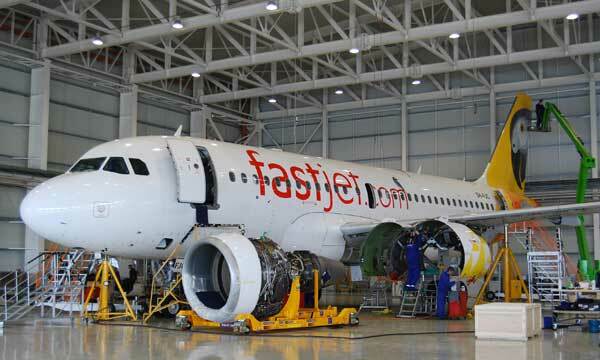 Aerostar contracts with Fastjet for a319 maintenance to cement its growing African market presence. Leading Romanian aerospace company Aerostar has won a contract from Tanzanian-based low-cost carrier Fastjet for the heavy maintenance of two of the airline’s fleet of three Airbus A319 airliners. The first of the aircraft arrived at Aerostar’s Bacau facility in February for its annual ‘C’ check and was redelivered on March 13, with the second aircraft arriving at Bacau on March 14. This major new contract from one of Africa’s newest and most exciting airlines underscores the growing market reputation that Aerostar is building across Africa for the quality, cost-effectiveness and on time delivery of its MRO services. Fastjet is creating Africa’s first pan-continental airline with initial operations commencing in November 2012. Currently the airline flies from five international airports in Tanzania providing convenient daily air services between Dar es Salaam, Mwanza, Kilimanjaro, Mbeya and Zanzibar. International routes are flown several times weekly between Dar es Salaam and Johannesburg, South Africa and from Dar es Salaam to Lusaka, Zambia. The airline plans further route expansion within East Africa. Across Africa, Aerostar has a long-standing customer in Royal Air Maroc which has entrusted its Boeing 737 family MRO work to the Romanian company since 2010.Starbow Airlines of Ghana is another customer that first placed its BAe 146 regional jetliners into Bacau for maintenance last year and will do so again this year. On behalf of aircraft lessor Falko, Aerostar also prepared two Avro RJ100 airliners for Air Libya in 2013.